The higher price helps overcome the cost disadvantages of renewable energy sources. The rate may differ among various forms of power generation. As FIT is normally phased out once the renewable reaches a significant market penetration, such as 20%, as it is not economically sustainable beyond that point. In general, U.S. FIT policies have not been based on the cost of generation plus a reasonable profit. Under the feed-in tariffs in California, customers are paid for the cost of generation based on the "market price referent". The price is based on the value of electrical generation, but is not intended to embed a subsidy or rebate in the price offering. Degression Schedule – Places downward pressure on renewable energy prices over time. Adopted in Germany. FIT – Feed in Tariff - An incentive structure to encourage the adoption of renewable energy through government legislation. Also called fixed-price policies, minimum price policies, standard offer contracts, feed laws, renewable energy payments, renewable energy dividends and advanced renewable tariffs. The value of different products, including baseload, peaking, and as‐available generation. Specifically, the MPR models the long‐term ownership, operating, and fixed‐price fuel costs for a new combined cycle gas turbine (CCGT). Therefore, there are four key drivers for the MPR calculation: fuel costs (i.e., natural gas prices), installed capital costs, capacity factor and greenhouse gas (GHG) compliance costs. The MPR establishes the market price of electricity in order to evaluate the price of long‐term RPS contracts. The MPR sets limits on the procurement obligations of retail sellers under the RPS program. PURPA - Public Utilities Regulatory Policy Act - A law passed in 1978 by the United States Congress as part of the National Energy Act. It was meant to promote greater use of renewable energy. This law created a market for non-utility electric power producers forcing electric utilities to buy power from these producers at the "avoided cost" rate, which was the cost the electric utility would incur were it to generate or purchase from another source. Generally, this is considered to be the fuel costs incurred in the operation of a traditional power plant. Although a Federal law, the implementation was left to the States and a variety of regulatory regimes developed, although in many states virtually nothing was done. The biggest result has been the prevalence of cogeneration plants, which produce electric power and steam. They are encouraged by the law on the theory that they harness the thermal energy (in the form of usable steam) that would otherwise be wasted if electricity alone was produced. PURPA is starting to become out of date, since many of the contracts made under it during the 1980s are expiring. Another reason for PURPA's reduced significance is that electric deregulation and open access to electricity transportation by utilities has created a vast market for the purchase of energy and State regulatory agencies have therefore stopped forcing utilities to give contracts to developers of non-utility power projects. However, it is still an important piece of legislation promoting renewable energy because it exempts the developers of such projects from numerous State and Federal regulatory regimes. PURPA payments to renewable energy projects were based on projections of avoided costs. In reality, actual electricity prices diverged greatly from forecasts. In contrast: FITs are based on renewable energy project economics. REC – Renewable Energy Credits - A REC represents the renewable and environmental attributes associated with the generation of one megawatt‐hour of renewable energy. RECs can be procured with the underlying energy in an RPS “bundled” contract or separately as a TREC or REC‐only contract. Only bundled contracts are currently allowed for the California RPS program, but in the past several months, the CPUC has taken several steps towards approving the use of TRECs. RPS – Renewable Portfolio Standard - A regulation that requires the increased production of energy from renewable energy sources, such as wind, solar, biomass, and geothermal. The RPS mechanism generally places an obligation on electricity supply companies to produce a specified fraction of their electricity from renewable energy sources. Certified renewable energy generators earn certificates for every unit of electricity they produce and can sell these along with their electricity to supply companies. Supply companies then pass the certificates to some form of regulatory body to demonstrate their compliance with their regulatory obligations. FITs replace competitive solicitations, not RPS policies. A FIT policy can be compatible with an RPS mandate. SB 43 - California Electricity: Green Tariff Shared Renewables Program. On Sep 11, 2013, The Assembly passed and the Senate subsequently signed off on amendments added by the lower chamber. The bill now is on its way to the governor. The "Green Tariff Shared Renewables Program" will be open to customers of the state's three investor-owned utilities: PG&E, SDG&E and SCE. Businesses and people who buy shares in renewable developments will pay associated costs and reap any financial benefits through lower electric bills. "S.B. 43 will allow the millions of Californians who cannot install their own solar unit, windmill, or other renewable power generation system to obtain renewable energy through their utility," the bill's sponsor, Lois Wolk said in a statement. "The bill will create thousands of jobs and encourage more investment in an important sector of our state's economy, while helping the state to meet its renewable energy goals." The measure allows investments in up to 600 megawatts of renewable energy, the amount that would power about 100,000 American homes, according to the Vote Solar Initiative, an advocacy group. Of that total, at least 100 MW must be available to residential customers. Community Choice Aggregators (CCA's) may voluntarily offer a similar program. The California Public Utilities Commission (CPUC) will set up rules delineating which clean energy projects qualify for the program, and how costs and benefits will be applied to the generation portion of subscribing customer bills. Vote Solar estimated that more than 20,000 residential ratepayers would be able to participate, if each bought on average a 5-kilowatt share. In addition, schools, local governments, businesses and the military are eligible to invest, according to the legislation. The bill that passed the Assembly had been changed significantly from the one that passed the Senate. In the earlier version, the measure allowed people, businesses and schools to invest directly with renewable energy developers. Under the version that passed, the utilities will contract with the renewable power developers and will manage electricity ratepayer participation in the green efforts. Language was also added to protect nonparticipating customers from cost shifts, changing utility stance from oppose to neutral. Standard Offer Contracts for renewable power development were first introduced in California in the early 1980s in response to the state's investor-owned utilities behavior toward small power producers. California's Public Utility Commission ordered the utilities to offer standardized contracts and to offer one such contract, Standard Offer No.4 (SO4) with fixed prices. Craig Lewis, the Executive Director of the CLEAN coalition, a group that seeks to bring feed-in tariffs (FITs) to utilities across the country, speaks at the July 2011 Intersolar Conference. 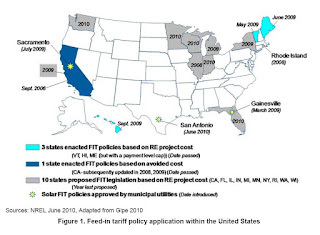 Feed‐in tariffs could potentially address a number of the barriers identified below and help California meet its 33% by‐2020 renewable energy target. 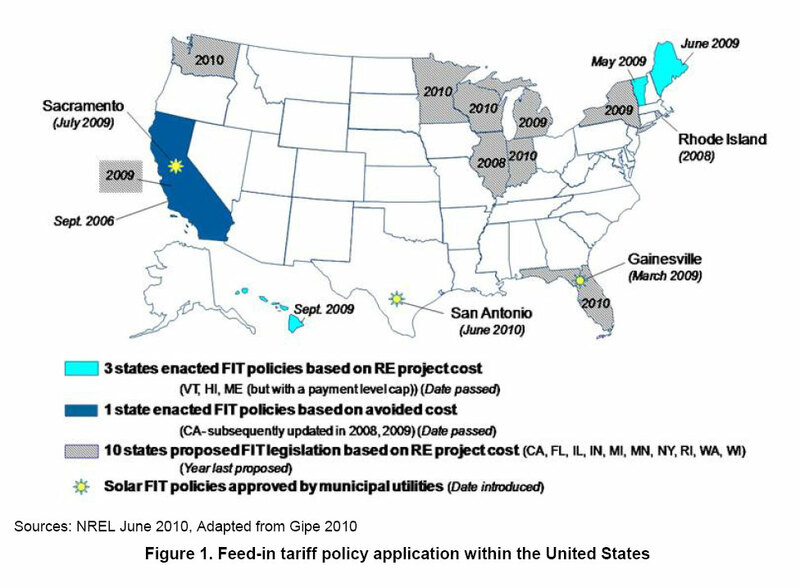 The California feed-in tariff was amended on October 11, 2009 when the Governor signed SB 32. The new law took effect in 2010. California previously had a feed-in tariff, but it only covered renewable power projects capable of generating 1.5 megawatts or less. Under SB32, the limit is increased to 3 megawatts. The California feed-in tariff allows eligible customer-generators to enter into 10-, 15- or 20-year standard contracts with their utilities to sell the electricity produced by small renewable energy systems -- up to 3 megawatts (MW) -- at time-differentiated market-based prices. The price paid is based on the CPUC’s market price referent (MPR) table. Time-of-use adjustments are applied by each utility and reflect the increased value of the electricity to the utility during peak periods and its lesser value during off-peak periods. A special, higher-level rate is provided for solar electricity generated between 8 a.m. and 6 p.m.
All investor-owned utilities and publicly-owned utilities with 75,000 or more customers must make a standard feed-in tariff available to their customers. As the feed-in tariff is meant to help the utilities meet California's renewable portfolio standard (RPS), all green attributes associated with the energy, including renewable energy credits (RECs), transfer to the utility with the sale. Any customer-generator who sells power to the utility under this tariff may not participate in other state incentive programs. The tariffs will be available until the combined statewide cumulative capacity of eligible generation installed equals 750 MW. Each utility will be responsible for a portion of that cumulative total based on their proportionate sales. The Federal Energy Regulator Commission (FERC) ruled on October 21, 2010 that California can require its utilities to pay a price for renewable energy that will support its Feed-In Tariff (FIT) plan. The ruling resets the existing price standard and is expected to drive the deployment of renewable energy. The ruling came because the California Public Utilities Commission (CPUC) had asked FERC to define what “avoided cost” means. Defining “avoided cost” was necessary because when California’s SB 32 instituted the FIT for medium-sized renewable projects in 2009, it also expanded the definition of “avoided cost.” State regulators are directed by FERC to protect the ratepayer. The CPUC therefore set California’s per kilowatt-hour electricity payment to generators of renewable energy projects of up to 20 megawatts at the lowest estimated price a utility would have to pay to obtain power from a new, industry-standard natural gas plant. That price was dubbed a utility’s avoided cost or in California the Market Price Referent (MPR). It follows utility rates in having a sliding time-of-use (TOU) (peak to off-peak) payment schedule. With the FIT instituted by SB 32, the definition of avoided cost was expanded to include environmental factors, a hazy term that became crucial to clarify when the FIT ran into another law. California’s AB 1613 requires utilities to purchase energy obtained through combined heat and power (CHP) generation. CHP systems recover at sites where electricity is generated and can reuse it to generate more electricity. Reusing electricity generated on-site requires no transmission. CPUC went to FERC with a proposal that CHP users be granted a higher return on the electricity they generate because it does not further burden the transmission and distribution system nor lose electricity on the lines and FERC agreed. 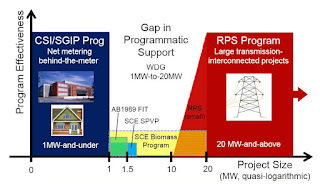 Besides granting the higher return to CHP systems, it granted value to the “locational benefits” of distributed medium-sized projects located at or near where their power is consumed because, it acknowledged, DG avoids the costs of using existing wires and the costs of building new wires and infrastructure. There are also avoided losses along the wires and other avoided costs that follow from DG projects’ location. Finally the ruling changes how Renewable Energy Credits (RECs) are used. Every kilowatt-hour of renewable energy purchased by a utility earns it a REC that applies toward renewably-sourced electricity requirements imposed by the state Renewable Electricity Standard (RES). The FERC ruling allows the price of the RECs to be unbundled from the purchase price and allotted a separate price by the CPUC, a price that captures the otherwise hazily-defined environmental benefits of renewable generation. Requiring utilities to pay extra for RECs adds to the amount that a renewable energy generator can expect to earn. 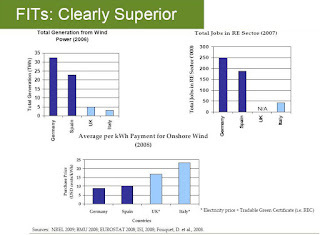 In states like California where there is no competitive REC market, the CPUC could set this additional return so that, combined with the total avoided cost (including locational benefits and comparable resource valuation), it adds up to to the same total as the cost of generation plus a reasonable profit used in a European FiT. AB 920 (the California Solar Surplus Act of 2009 ) became law in October 2009. It requires utility companies to pay households or businesses for any extra electricity produced by the customer’s solar power system. It also allows the utility to count the amount of electricity purchased by the utility through this surplus power program toward their annual renewable portfolio standard goals. Proper design is critical to the success of a feed‐in tariff. If the tariff rates are fixed and cannot be adjusted, for example, they may not be flexible enough to respond to changing market conditions. Moreover, some feed‐in tariffs intentionally or unintentionally favor less efficient plants. As renewable energy resource potential is not uniformly distributed across California, unequal costs are likely to be incurred by interconnecting utilities, raising the issue of cost allocation. Finally, tariff quantity limitations or declining tariff price blocks may encourage speculative queuing, in which projects with no real commercial prospects detract from the success of a feed‐in tariff by reserving funds that are ultimately not disbursed or are later released at a lower incentive level. Policy makers should strive to minimize such negative, unintended outcomes with careful feed‐in tariff design. Reduced Carbon Emissions - Looking closer at the data, , it's clear that Europe owes less of its emissions reduction progress to the Emissions Trading Scheme (ETS), the carbon-trading program that the European Union instituted in 2005. than is commonly advertised. What's more, the impressive growth rates clean energy technologies are experiencing in several European markets are the more the results of generous deployment subsidies than the carbon price signals established by the ETS. European feed-in tariffs establish price signals - effectively rewards for avoided carbon emissions - that are many times higher than the explicit carbon price levied by the ETS. Reduced Administrative Cost - Reduce utility and regulator administrative burdens and are more transparent to administer than the current system. Reduced Transaction Costs. Current complexity hampers the ability for small businesses and small projects to participate. FIT Shift competitive pressure from generators to manufacturers and suppliers of renewable energy generation equipment. Reduced Risk - Increase the willingness of developers to take on risk in addressing siting, permitting, or other barriers because the reward has a higher degree of certainty than under the current regime. The upfront costs associated with participating in a solicitation process represent an at‐risk investment for the generator under the current system. Such at‐risk upfront capital is the most expensive form of capital, and can add materially to the development capital needs of a project developer. It is also the hardest capital to raise, compared to financing of a project with known and secured revenue stream. Reduce project developer costs, risks, and complexity without increasing ratepayer cost (relative to the cost of viable projects. Reduced Energy Cost - Add the possibility of lower overall costs. Currently, low‐cost, viable projects could target their bid to the anticipated MPR. In contrast, a feed‐in tariff could be bid below the MPR for these resources. Despite the perceived high cost of feed‐in tariff policies, recent analyses from both Germany and Spain have concluded that the rapid expansion of renewable electricity has decreased wholesale spot market prices. In both cases, the estimated savings have been comparable or have exceeded the cost of the policy itself. Reduced Project Costs - Project timing is not constrained by periodic solicitations. In addition, completion dates may not be constrained by contractual requirements, quantities are often uncapped, and interconnection is typically guaranteed. Together, these characteristics can help to reduce or alleviate generator revenue uncertainty, project risk, and associated financing concerns. Reduce Rate of Contract Failure. as opposed to speculative bids. Encourage More Market Participants – Because responding to standing tariffs is likely to be substantially less costly and less complex than competitive solicitations, feed‐in tariffs may increase the ability of smaller projects or developers to participate. Access to upfront capital is a substantial barrier for smaller developers, and the costs are substantially higher on a per‐unit basis for small projects. Promote Technological Innovation. - In Europe, feed‐in tariffs have driven technology cost decreases in key markets, and have also created the conditions for technological advances and innovation. These gains have come as a result the ability of feed‐in tariffs to support rapid technology diffusion, and to create a stable investment climate. Feed‐in tariffs have enabled manufacturers to expand production and to invest in product and process efficiencies. Developers that are able to use more efficient, less expensive technologies are able to garner higher profits under fixed‐price, feed‐in tariffs. Manufacturers, therefore, must compete to provide the most efficient product. This shift in competitive focus can have important implications for capital‐intensive renewable technologies, such as wind and solar power. Support Local Energy Generation - The FIT Coalition claims that distribution-interconnected generation is 35 percent more valuable than transmission-interconnected generation because of low transmission losses and not having to build out the transmission grid. Net Metering does not provide any financial incentive to maximize rooftop solar potential. A FiT would be more efficient. Rooftop installations would be built to provide the maximum power rather than to only power the buildings below. Uncertain RPS Impact - The quantity of generation responding to a feed‐in tariff is not typically predetermined (though it can be capped). Total feed‐in tariff costs cannot be predicted accurately. Who Pays?- One key issue is how the tariff fits in a deregulated market structure, including questions of who pays, how payments are distributed, what portion of rates would be used to recover tariff costs, and how to integrate electric production purchased through feed‐in tariffs into utility power supplies. Another question specific to California is whether feed‐in tariffs would work in concert with California’s existing RPS law or would require changes in that law. Pricing Uncertainty - Getting the price right can be challenging. If the price is set too high, the tariff introduces the risk of overpaying, over stimulating the market and and removing political support for the program,. This risk may be exacerbated when the tariff is open to large projects in regions with ample resource potential. On the other hand, if the tariff is set too low to provide adequate returns to eligible projects, you don't have market activities. With a competitive solicitation, you get the going rate and you get your projects. Rate Impact In the process of establishing prices for feed‐in tariff implementation, the tradeoff between the policy’s effectiveness at increasing quantity of renewable energy and its ratepayer impact can be managed through determining how aggressive or conservative the price is set for each technology. Inflation Indexing - By tying price to variable values, rather than a decreasing schedule of fixed payments, there is a greater chance that support levels and generation costs will diverge. If the value indicator decreases significantly, it can mean that generators will not receive the payments they need to remain viable, whereas if the value indicator increases significantly, this can lead to overcompensation, as with the Spanish premium option, which is now capped to avoid some of this risk. Moreover, setting feed‐in tariffs at a premium on top of market prices diminishes the ability of fixed‐price contracts to serve as a hedge against rising electricity prices. This problem also occurs when feed‐in tariff payments are pegged to indicators that increase over time. Pricing Emerging Resources - At the EU level, analysis has concluded that support for emerging resources in the short‐term could decrease renewable energy policy costs in the long term. Along these lines, Spain and Germany have each created feed‐in tariffs for both near‐market and emerging renewable resources. This policy decision can be challenging, however. In the case of PV, for example, both countries have acknowledged that the high price paid for PV creates additional policy costs, but that these costs are justified because they are blended with the savings created by near‐market resources and by the fact that promotion of PV is an industrial (that is, market capture) policy, in addition to an energy policy. Despite their commitment to PV, both countries have also attempted to address political concerns over policy cost by recently decreasing their PV feed‐in tariffs. Power Trading Rules - Smart Grid will also require changes to be made to how the Power Trading is done. If smart grid will allow any person to generate power (via solar panel on his houses’s roof), there need be predefined set of rules, each power provider will be payed, someone who is just generating very little power compared to some companies who owns many big generators. The settlements rules have to be different for both these types of customers. Unless these rules are finalized, ISO/RTO will not be able to operate properly to maintain price and faireness in the market. European countries where FIT is implemented have more total wind generation and associated jobs and even lower average cost. Long‐term, generation cost based payments - In both Germany and Spain, incentives set according to generation cost have spurred rapid market growth and have significantly increased the proportion of renewable electricity in the national supply. Germany has achieved its renewable goals ahead of schedule and has set new targets as a result. Technology Specific Tariffs Set at Appropriate Levels. Germany’s early value‐based feed‐in tariff created incentives for wind but did not accelerate markets for other technologies. The technology‐specific tariffs in Germany and Spain, by contrast, caused rapid market acceleration across a portfolio of mature and emerging technologies. The portfolios differed, however, based on the policy priorities in both countries and the manner in which generation cost was defined. In Germany, biogas tariffs have been set high enough to encourage the cultivation of energy crops specifically for anaerobic digestion, whereas in Spain, the pending solar thermal electric development reflects the fact that tariffs have been set at levels sufficient to encourage thermal with storage capacity. Price Certainty & Policy Certainty – Drives investor security. The European Commission study on comparative policy effectiveness highlighted the importance of investor security. While both the German and Spanish feed‐ins provide long‐term payments to generators—minimizing risk to individual projects—the German feed‐in tariff provides more price and policy certainty over time than the Spanish policy does. Not only does the Spanish tariff adjust each year (according to the Consumer Price Index), but the tariff also has revisions, triggered by capacity goals, without clear rules as to what types of revisions might occur. This uncertainty created widespread concern when installed PV capacity recently crossed the trigger point, and the market stalled. The subsequent, sudden, and significant decrease in PV incentive levels contrasts with the comparatively orderly and phased schedule of PV degression rate decreases in Germany. Price Degression - In Germany, rates are fixed for 20 years, but the fixed rate available to generators declines each year according to a schedule based (at least theoretically) on experience curves. This approach provides a degree of planning certainty to developers and also puts downward pressure on prices. By contrast, the Spanish approach includes more risk and does not put downward pressure on prices for investors and developers because both the tariff and premium options vary with the Consumer Price Index and because the premium option varies with the wholesale market price. Ontario - The Feed-In Tariff is weeks away from being launched. Ontario's Green Act includes 20 year FIT contracts for solar rooftop PV installations offering between 60 to 80 cents a kilowatt hour produced and fed directly into the grid. Other renewable energy generation will also be encouraged and paid for at varying rates, and unlike solar, the payments will be adjusted for inflation. Gainesville, FL enacted a German style FiT in early 2009, which is sold out to 2016. This municipality has high rates in the 26 to 32 cent range. California's SMUD launched a FiT in 2009 with low rates in the 14 to 15 cent range. Discussions for FiTs are in the early stage with Palo Alto, California and several local utilities in Colorado. Vermont enacted the first statewide FiT in mid-2009. REESA and AB1106 are now active in California. CSI - California Solar Initiative - The CSI Program has a budget of $2.167 billion over 10 years, and the goal is to reach 1,940 MW of installed solar capacity by the end of 2016. CSI requires that solar systems that receive an incentive be sized to meet on-site loa d. Previously, any excess generation, after the annual net metering true-up, was gifted to utilities. AB 920 (Huffman; sponsored by Environment California) passed in 2009, required California Investor-Owned Utilities to purchase net surplus generation at a rate set by the Commission, under some very specific parameters. After voluminous commentary by parties to the proceeding, on June 10 the CPUC issued a decision in June 2011. Unfortunately, it isn’t going to be much. The Commission voted 4-1 to use short term, day-ahead pricing, rather than a metric that recognized that solar is a long-term generating asset. Current DLAP pricing isn’t much (we’ve had a great hydro year — on May 31, DLAP was 0.2 cents/kWh for the day) on August 4, the price had risen to 0.47 cents/kWh and futures indicate a 2012 average under 4 to 5 cents/kWh. A concern is that this doesn’t set adverse precedent. Take a look at the video of the vote (you need RealPlayer). While the Commissioners left themselves room by pointing out that these are not long-term contracts and therefore deserve different treatment and value, they also indicate that costs are a primary motivating concern. Here’s the SF Chronicle article. In 2009, the California Public Utilities Commission (CPUC) adopted D.09-12-042 pursuant to AB 1613 (Blakeslee, 2007), which established a feed-in tariff to support the deployment of CHP applications. Under the terms of this decision, the IOUs were directed to procure energy from eligible facilities at a price based on the cost of energy produced by a new combined cycle natural gas turbine. 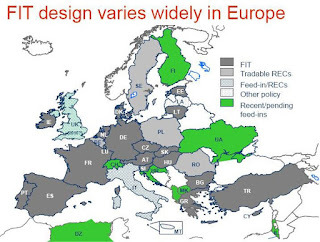 Despite this flexibility, as a practical matter, states may be interested in supporting certain generating technologies via policies like feed-in tariffs, which may prove difficult to implement under the avoided cost framework. For example, for those technologies that are subject to technology risks, or that have not achieved sufficient economies of scale, the price that can be justified on an avoided cost basis may not be adequate to drive deployment. Given the pressing need for state level action to address climate change and the variety of low or zero emission technologies that can contribute to this objective, states should be authorized to regulate wholesale prices to promote these technologies. In April, 2012 California PUC Chairman Peavey proposed net metering cap methodology that,if approved by the full Commission, will help boost solar use by homeowners, businesses, and public agencies. Net metering works like “rollover minutes,” with customers receiving credits on their bills for the excess power they generate that is put back on the grid. There is a cap on the amount of net metering that must be made available to customers – beyond that cap, there’s no guarantee that utilities continue to allow new solar customers to net meter. California’s law sets the cap at “5 percent of aggregate customer peak demand,” but does not specify how utilities should calculate that number. Consequently, utilities are using a more restrictive methodology that results in almost 50 percent less net metered solar and renewable energy than would otherwise be allowed. Peavey argues that the Legislature did not intend “aggregate customer peak demand” to simply mean coincident peak demand. Instead, it means the sum of each individual customer's peak demand. The phrase “peak demand” is used in multiple instances in the Pub. Util. Code to signify coincident peak demand. If the Legislature had intended the language in § 2827 to mean coincident peak demand, it would have used the term “peak demand” to avoid surplusage and internal inconsistency in the Pub. Util. Code. The Clean Coalition - Non Profit whose mission is to identify and advocate for policies that will accelerate the deployment of cost-effective local energy. It believes the right policies will result in a timely transition to renewable energy while yielding tremendous economic benefits, including new job creation, increased tax revenue, and the establishment of an economic foundation that will drive growth for decades.